There are few simple pleasures that are better than a chewy, chocolate chip cookie fresh from the oven. Unfortunately, it’s probably a fire safety hazard and bad office form to bring an Easy Bake Oven to work, so it’s nearly impossible to have fresh, warm chocolate chip cookies in the office. Alas, we must instead buy packaged cookies and hope that they taste great and don’t break our teeth. 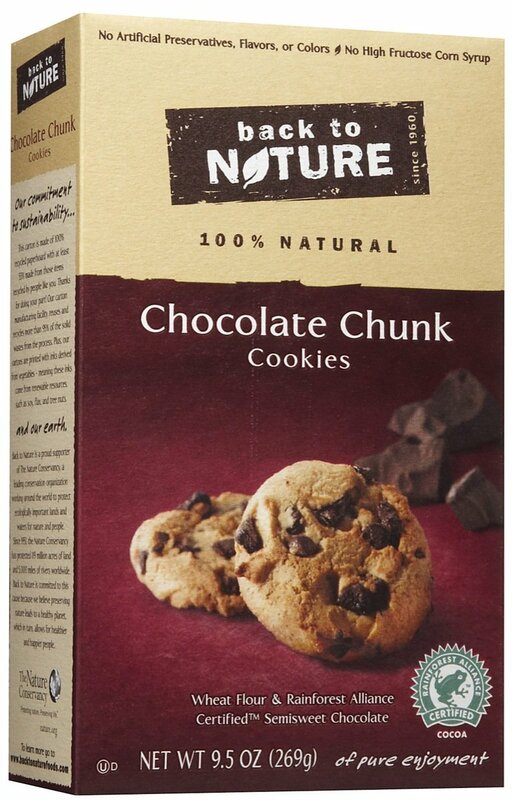 Enter Back to Nature Chocolate Chunk Cookies. While it has been years since most of my peers have eaten Gushers, Fruit Roll-Ups, or Fruit-by-the-Foot, I’ve actually eaten those candies within the last couple of months. I just love candy. [Don’t] Sue me. My friend Rosa, well aware of my predilection for fruit-flavored candy, suggested that I try fruit leather. “Suuuuuure”, I told her in that “don’t hold your breath” kind of way. But the weekend rolled around, and as my Olympics-induced awareness of my mediocrity heightened, I figured it was time to step outside of my comfort zone and do something different. It was time to not only know better but to do better. Fruit leather would obviously be instrumental in this transformation. 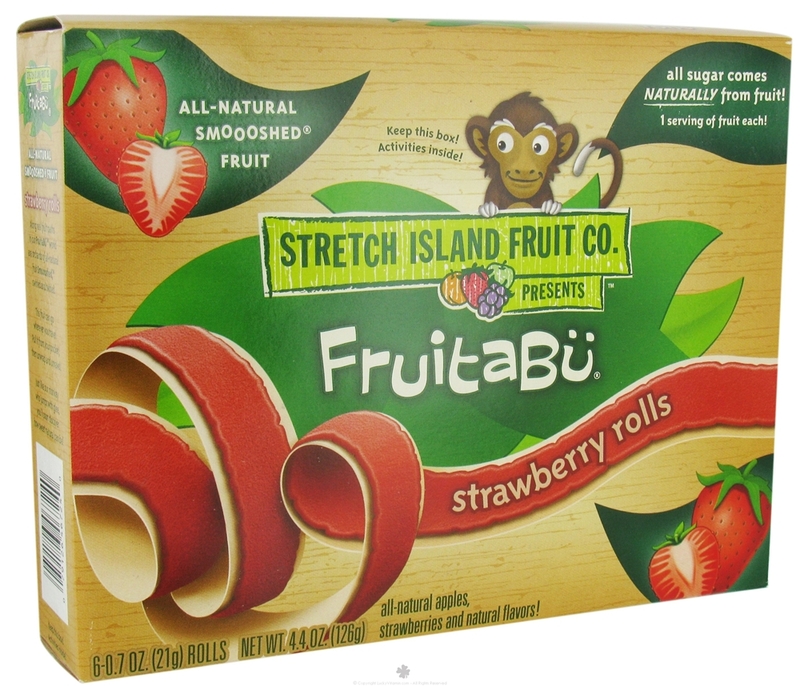 But the health food store was all out of fruit leather, so I picked up a box of Stretch Island Fruit Co. Smooshed Strawberry FruitaBü instead. If you’re a regular snack eater, you probably find that some of your snack cravings are the result of mouth hunger (the desire to eat something just to taste the flavors) rather than actual stomach hunger. 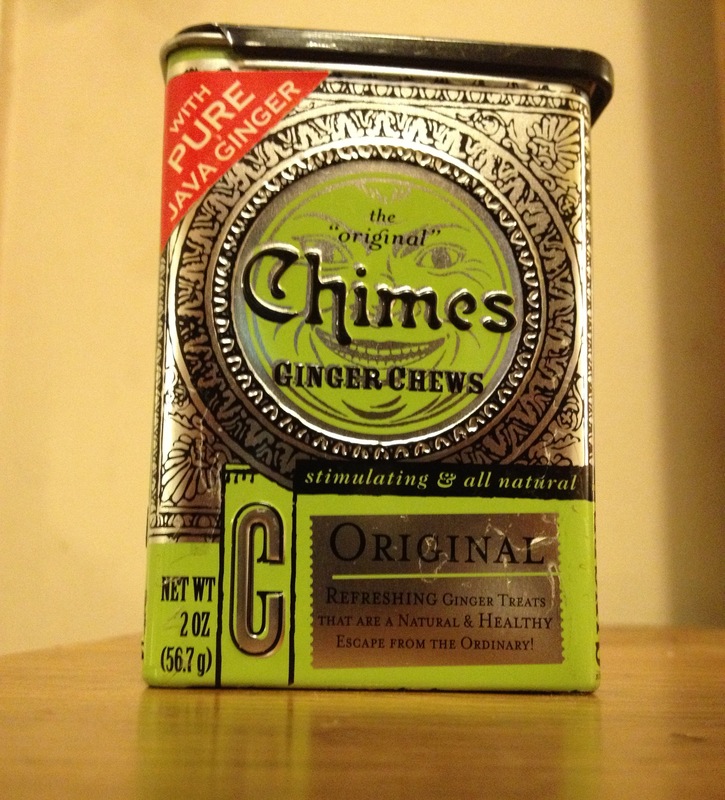 I have a sweet tooth so this happens quite frequently for me and that’s why I am forever grateful to my friend Nicole for introducing me to Chimes Ginger Chews. Since we don’t have photos of the muffins, how about some bottles of maple syrup instead? Susan Walling of Walling’s Maple Syrup (which we featured in our first Off to Market) shares a tasty and easy family recipe for maple blueberry muffins. If you live in New York City, particularly in Manhattan or Brooklyn, it’s very likely that you have stumbled upon one of the city’s numerous farmers markets. Farmers markets are an invaluable community institution: by bringing people together over a mutual love of fresh and healthy food, farmers markets help foster strong relationships between consumers and local vendors. 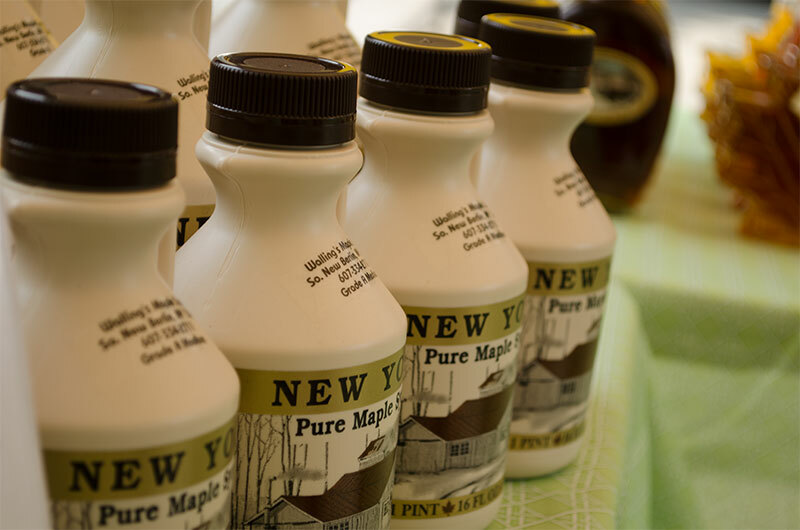 Based in South New Berlin, New York, Walling’s Maple Syrup is a family-owned and operated maple syrup business. 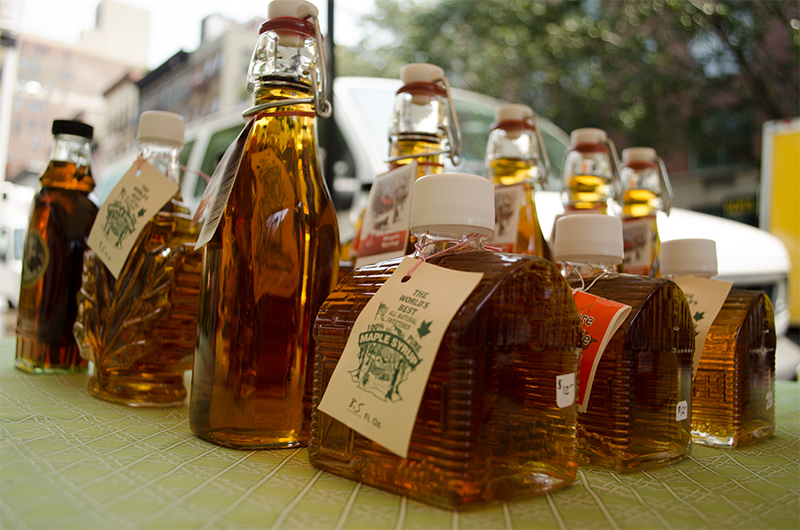 The Wallings have been producing maple syrup for over two decades, and now you can purchase their syrup and other sweet treats every Saturday from 8:00AM to 3:00PM at the Tribeca Greenmarket (Greenwich St. @ Chambers St.). The first time I saw an ad for a 100 calorie snack bag of cookies, I rolled my eyes. The first time I tried a cookie from a 100 calorie snack bag of cookies, I rolled my eyes so hard, they almost got stuck. These “cookies” were just as much cookies as I am an investigative journalist. These “cookies” were comparable in width to Listerine strips! You know, those paper thin strips that melt on your tongue and don’t satisfy your hunger because they aren’t food? These “cookies” were missing nine-tenths of the cookie! Of course they were only 100 calories! No thanks. But desperate times call for desperate measures, and when I found myself in the depths of snacking despair, I returned to the box only to find that all of the chocolate “cookies” were gone. 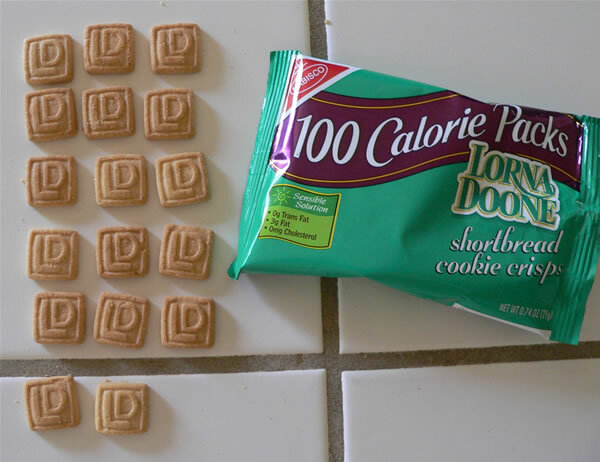 The only snack left was a bag of Lorna Doone shortbread cookies. I have been reading your blog for several weeks now and I thoroughly enjoy it. One minor difference for me is that I am not a skinny girl, in a skinny office. I am a chubby chick surrounded by other fellow chubby co-workers. The vending machine isn’t far from my desk. Even though my knees hurt from my weight while walking to select my favorite junk snacks, I push it that extra burn to get to my prized food of choice. And not to put myself down, just telling it like it is, I suppose if I used the same amount of energy to exercise I’d be better off, none the less I do move to get my food, does that count for anything? However, all kidding aside, your blog has helped me to begin to change my habits. At first, I will not lie, I felt sad thinking why can’t I think like they do and just eat skinny food for skinny people. But, after a few reads of your food choices and that you actually do eat the stuff you write about, I thought why don’t I follow their suggestions and at least try. The reason I am writing this, is because after taking in all that you have been teaching me on your blog, I have started an exercise regimen and even joined a weightloss group and I have set a weightloss goal! (Do you realize how many woman who are struggling with their weight, are stuck in their mindset of eating all the wrong foods, continually making poor food choices, who can benefit from the information you write on your blog? And you even make it light and cheerful and smart and funny!) The fact is that I like what you have to say, and yet I am not as skinny as either of you (by the looks of your logo and the few scattered photos I have seen on your site, I see that you are in fact skinny true to written form). Nor am I as skinny as the majority of NYC’s young, lithe, office workers in their fabulous fashions. But just maybe if I do make the healthy choices that you suggest, I will maybe be one step closer to my target weight and hey, if you wanna be healthy skinny, do as skinny office girls do. Now trust me, I have enjoyed getting to the poundage I am at now. The food was wonderfully satisfying, until I stood on the scale after gorging. Understand though, I do believe people are beautiful in all sizes, big and small. But for me, I also want to feel good, and well, being overweight does not make your body feel good. It is a burden especially walking, and most painfully walking up and down stairs, and when you start to wobble, well that is a clear indication that you pretty much have to start to reduce. And quite frankly, I wasn’t born fat so I really should not be fat. An extra meatball, a pizza slice and pretty much an extra of anything I could get my grubby little hands on (as well as stress) led me to this unwanted and unnecessary weight gain. Your blog and sense of humor have been slowly inspiring me to see the ‘light’ (in snack food). And even though you and I are not similar in physical and gastronomical respects, I do enjoy the healthy snack ideas that make the two of you stay so very slim and trim, and I tried a few of your suggestions and I can actually say that I can eat this stuff and feel satisfied. For instance, I find the mini babybel light cheeses quite tasty and a great idea for on the go when you have to rush out the door without breakfast or lunch. Most importantly, I started to take control of my situation and my health and my life. Thanks to you girls, I even started to do some research on my own, looking for a healthy snack that can be substituted for one of my fave junk food items and I found an online website that carries this DELICIOUS candy snack that is actually low-cal, low-carb and high fiber and it tastes like one of those chocolate turtle candies that I can buy in any weight per bag candy store! I kid you not skinny girls, this chubby girl found something that even you and I can be on the same level playing field with, CHOCOLATE, and it is not the high calorie scrumptious chocolate, but it’s every bit as pleasing to the taste buds. 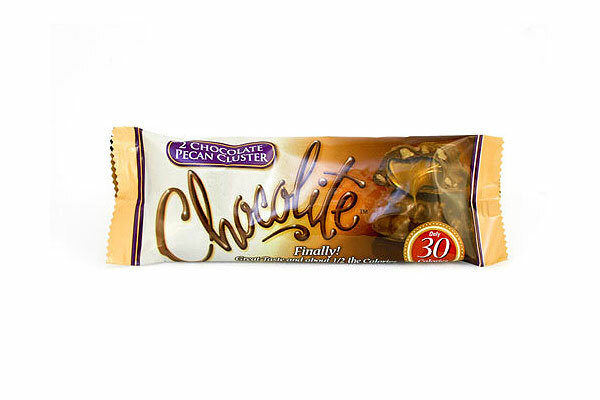 The new prized food “Chocolite Pecan Clusters” (the website sells several different varieties of chocolate candies). Believe me and I know you will, considering I am a walking resume of knowing my food. 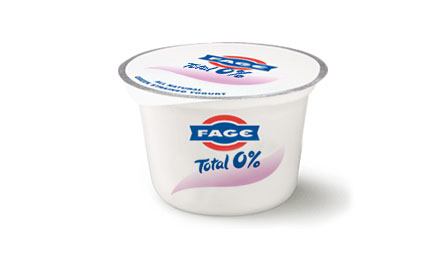 This stuff tastes great, and it can actually be eaten without guilt!!! Don’t ya just love me? I mean ‘it’? Well, there you have it, I just want to share this with you girls and all of my sister tribe out there, no matter how big or small you are. Girls unite for a firmer derriere and a healthy body, mind and through-the-roof confidence and maybe even a whistle or two when you walk down the street. The one main reason that I can function throughout the day like a semi-normal human being also happens to be my best friend: coffee. I love having coffee any time of day and need it for just about everything I do. I think my passion for a good cup of joe began when I worked at the “alternative” coffeeshop in my hometown, the one where nobody except my own friends went to, and even they only came after I lured them with promises of free coffee. No wonder it went out of business soon after I left…whoops. So I used to be what many might call a coffee purist, meaning that I take pleasure and pride in looking down upon those who need sugar or milk, or those who use any sort of weird flavoring in their coffee. Which is totally hypocritical because I always take skim milk in my coffee, and when I am at Dunkin’ Donuts I only ever get their hazelnut coffee. But whatever, I’ve already made peace with the fact that I’m going to be one of those “do-as-I-say,-not-as-I-do” moms. But my biggest crime as an already-not-so-pure-coffee-purist is using Sugar-Free French Vanilla Coffeemate. It’s creamy AND sweet, the two things coffee connoisseurs despise most, but it is just SO GOOD and makes coffee taste like a happy dream (before you wake up and realize you’re not BFFs with Beyonce after all). And since the best thing about coffee is that it is calorie-free–God bless whoever invented it!! !–the fact that this sugar-free coffeemate is only 15 calories per tablespoon means that you don’t have to feel at all guilty about using it with every cup. P.S. This Coffeemate also goes GREAT in Diet Hot Chocolate for a little touch of creaminess (thanks to one of my BFFs Katie for this delicious discovery)! If I were a Greek goddess (on days besides Halloween and my birthday), my one weakness that would ultimately cause my grisly and untimely demise would be decision-making. Well, maybe tequila shots also but that’s besides the point. Now you have sufficient Elena-background to understand the significance of the following event. The other day I was standing in front of the refrigerated drinks at my local deli, looking at the plethora of options and wondering how I was possibly going to choose only one afternoon drink from this beverage smorgasbord. I was kind of craving lemonade, but at the same time, there was no way I could afford to get a drink without caffeine. I couldn’t decide what to do. I stood in front of the drinks for so long that the guy behind the counter first asked me if I needed help, then a few minutes later asked if I was okay. No, I wanted to say, I have a debilitating decision-making disease and I’m not okay, but I refrained. No need to plague others with my problems. The Greek goddess in me just got a little stronger. Then I spotted the perfect compromise for my lemonade-caffeine dilemma: Diet Half ‘n Half Snapple, which has half lemonade and half iced tea. (I think it’s called an Arnold Palmer, but that name makes it sound super uncool so I like to pretend I don’t know that.) I knew they made it in REGULAR but not in DIET, so as soon as I saw it and realized that it would a) solve the problem of making this horrible decision, and b) not be many calories, I immediately grabbed a couple and hobbled over to the counter (my knee is hurting me these days). You may have to do a little searching for these bad boys, but, unlike actual bad boys, they are worth it. (Why do I say these things?) The mix of sweet, refreshing lemonade and caffeinated iced tea is the perfect workday afternoon beverage. No decisions necessary! Hot Chocolate and Greek Yogurt– a winning combination! I’m a huge fan of the Today Show. I watch it every morning, and I truly feel like I’m part of the Today Show family. I cried on Meredith Viera’s last day as co-anchor. I counted down the seconds with Matt Lauer until Justin Bieber’s Christmas performance. And I spend every moment of the 4th hour wishing that somehow– despite the fact that I’m 23 and a half years old and have two wonderful parents– Kathie Lee and Hoda will adopt me. Yes, I know me being adopted by two 50-something talk show hosts is a stretch…but a girl can dream! Me and my friends, Kathie Lee and Hoda. So yesterday morning, while Kathie Lee and Hoda were enjoying their weekly Boozeday-Tuesday, I was sitting on my couch scheming ways to get them to notice me. My attention was diverted though, when Today Show nutritionist Joy Bauer appeared on air to give Kathie Lee and Hoda low-calorie food options to beat their cravings. Kathie Lee craves eggplant parm– Joy suggested a baked (not fried) version. Hoda craves mashed potatoes, and Joy suggested a half mashed potato half mashed cauliflower creation that sounded delicious but a bit too ambitious for an amateur chef like me. I was a bit turned off by all this– not because of Joy or Kathie or Hoda (there’s nothing they could to do make me dislike them), but because none of the options I saw were simple enough for a kitchen-phobe like me. But then they started talking about chocolate. I’m in no position to be blogging about recipes. As I’ve mentioned before, I rarely cook. And by ‘rarely’ I mean you’d be more likely to find me in a Rikers Island prison cell than in a kitchen. But despite my lack of expertise (and lack of interest) when it comes to cooking, I’m going to stray from the typical SkinnyOffice snack recommendation today because I think you all deserve to know about the most amazing thing I’ve ever heard on a morning talk show. A delicious chocolate snack for 150 calories: mix 6oz of nonfat plain Greek yogurt with one package of low fat hot chocolate (like Swiss Miss). It’s essentially chocolate pudding, it’s completely delicious, and it has close to 20g of protein. Joy Bauer calls this “protein pudding”, and call it whatever you want, but it’s amazing.